The Kakahi Queen is a classic New Zealand stream pattern. 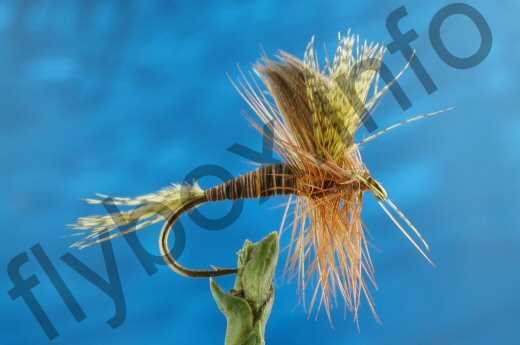 It is a wonderful dry fly that imitates the adult colobuiscus, one of New Zealand's larger mayflies which is distingished by the yellow colouring on the wings. It is most active from November to March. Thread : Light brown or olive. Tail : Mallard flank dyed yellow. Body : Stripped yellow/olive quill. Wings, outer : Mallard flank dyed yellow. Wings, inner : Mallard flight feathers. Hackle : Light brown/dark ginger. Currently there are no comments about the Kakahi Queen fly pattern from other fly fishermen yet.